Should You Tell Your Boss You're Job Searching? If you are considering your next career move, you likely have kept your job search confidential at work. But when is the best time to tell your boss you’re job hunting? Should you remain quiet when a potential employer asks you for an interview? Do you let your manager know once you’ve been selected as a finalist? Or, do you wait until you receive the new job offer in writing to break the news to your current employer? The answer is that it depends. It depends on you, your boss, and what your workplace is like. It’s a decision not to be made lightly because it could put your current job in jeopardy. First, mull over your own tendencies and habits. How have you handled previous job searches, and how did it feel from a moral perspective? Think about colleagues who kept their candidacy quiet and those who shared their upcoming interview with the team: Which felt to you like the more appropriate approach? If you are leaning toward sharing this potential career opportunity, ask yourself why and be honest. Are you compelled by a sense of loyalty to your staff, CEO, or company? Or, are you hoping the news might provide useful leverage at your current job? Your boss might offer you incentives to stay, such as increased salary or a promotion (but, this is a risky game to play). How anxious you are to leave your current position? Are you miserable in your current work, or just curious about the potential elsewhere? Disclosing that you are a candidate at another company may put your current job at risk. It is vital to keep in mind that if you aren’t selected for the new position, are you willing and able to continue your job search while unemployed? No matter your personal ethics, the decision to tell depends greatly on the climate at work. Circumstances are different in every company, with each boss, and even from day to day. Has anyone else in the company lost their job after being honest about their search? When an employee does leave, is the general mood one of celebration for a new opportunity or resentment about perceived disloyalty? Do you have a respectful, trusting relationship with your superior, or do you fear retribution? Some bosses truly support the growth of their employees and understand that it may sometimes require a job switch. You could receive encouragement and support, not to mention a terrific reference to share at your interview. Consider also whether the mood in your current office would change if you are not selected for the new position; even the most supportive boss and colleagues might be concerned that your focus is directed toward leaving the company, rather than toward the work at hand. If you decide to be honest, particularly in the early stages of interviews, your potential employer might view this transparency as a red flag. Perhaps you are using your candidacy as a way to leverage a better position at your current job. Timing is everything in this decision: If you are being seriously considered for the position, it may be the time to divulge the news, particularly if there’s a risk of it becoming public whether you like it or not. The most cautious (and sometimes the wisest) approach is to wait until you’ve accepted the new position and signed on the dotted line. Above all, use your common sense when evaluating yourself, your company, and your future employer. 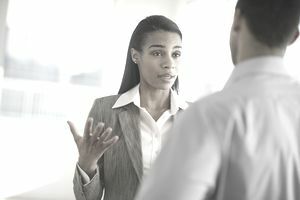 The decision is rarely easy, but the good news is that most candidates who are qualified for leadership roles are also insightful enough to make the right choice about whether to speak up or stay mum. When Should You Disclose Your Disability During Your Job Search?